FOMO – waving or drowning? We’re drowning in a ‘tsunami of data’ said a group of WSH grantees at the 2014 Building Demand for Sanitation (BDS)2 convening. Time was when email was a welcome game-changer and people were in awe of the almost limitless information seeking and sharing opportunities afforded by the Web. But now the relentless and constantly increasing flow of articles, reports, research briefs, books, newsletters that compile all the above for ‘convenience’ threatens to overwhelm anyone trying to keep up with their specialist subject. And “Fear of Missing Out” (FOMO) - fear of missing trends and key new material is a major contributor to the anxiety caused by being unable to swim easily through the floods of information. In 2013 Ned Wells started circulating a short monthly update of digital marketing insights and clips that had struck him as useful and interesting. There were five items, in each update, with one short sentence explaining why Ned valued the piece. It took a couple of minutes to scan. I respect Ned as an expert in what he does and there were generally one or two items worthy of a quick click through, and occasional gems that merited a longer read, and a share. Simple, practical and anxiety reducing – ‘at least I’m keeping up with what people are saying, and the clips from Ned, who knows what he does, show that I am still in touch”. To address the vision statement in the second clip above (from another group in the 2014 BDS convening), in the BDS Knowledge Management (KM) project we borrowed the key elements of Ned’s idea: regular, short updates curated by specialists within a bounded subject domain, selected for a specific audience. Economy and efficiency were also key criteria in the design: we were testing whether a useful service could be delivered on minimal resources so that it would be a sustainable option, something that could be taken on by a larger organisation. Our target was that delivering the updates should take two or three days per month each, i.e, approx. 20% of a full-time post. We aimed also to mirror the level of interest demonstrated by Ned Well’s service, described above, recognising that a significant part of the value of such a service is addressing the FOMO. So we aimed for a 20% – 25% success rate in terms of interest. We were very lucky to engage two excellent curators, respected, assiduous WSH specialists who were well connected to movements in WSH debates and publications. Pier Andrea Pirani has already blogged about our technology choices (a Wordpress blog and Mailchimp for the newsletters) and also about how we measured the progress of the trial service. The curators took on the responsibility of entering updates into the blog platform and the process of sending the newsletter was partially automated, requiring in the end only a couple of hours. This activity was planned around a “publish, review, adapt, publish” cycle for 12 months. We tweaked and adapted the process, the newsletter and the content after each issue. The number of people signing on to receive the updates more than tripled over the 12 months all by word of mouth. We reviewed the output to-date with grantees at the January 2015 BDS convening. 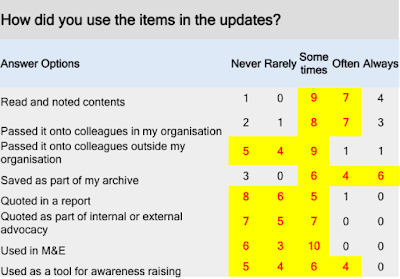 Following feedback, including from the curators about the difficulty of identifying genuinely new or outstanding content when there were disappointingly few recommendations from grantees and others on the list, we reduced the number to four updates a month and the curators sought to cluster the updates thematically. As shown above, the open rate (% of subscribers that open newsletters) was always above MailChimp’s ‘industry average’ (NfP organisations), and once we had resolved a bug in Mailchimp’s statistics, we could see that the click rate (% of successfully delivered campaigns that registered at least one click) was consistent. The most significant finding is that the open and click rates remained constant even while the number of recipients consistently grew, pretty much in line with our plans. And as is shown in the responses above, the updates rippled out across grantee’s own networks. Speaking as someone whose digital archives go back over 15 years, who hoards web-links (using delicious.com), and whose digital filing structure is so rich and complex that it is generally quicker to search across the directory tree than attempt to navigate it, I recognise the compulsion to gather material that passes across an e-desk. 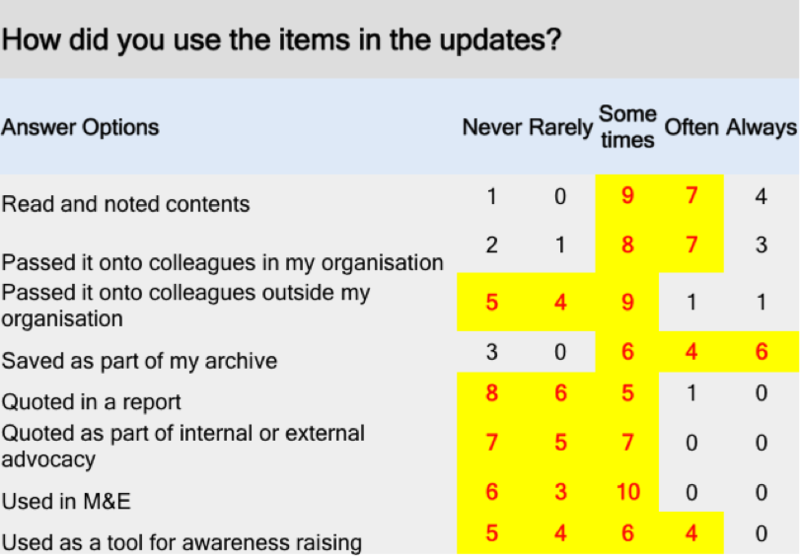 And there’s clearly a role for organisations in collecting and sharing as much material as they can gather, for sharing with their own networks, for reference and for archiving. However, the demand from this small but important group of WSH specialists was to experiment with ways to amplify the signal to noise ratio of information. The case presented by the Curated Updates experiment is that a small investment in curation can deliver a significant return and deliver value to a targeted, bounded set of Development specialists – from practitioners through to those at the heights of policy and academia.